You can configure a VPC peering connections to provide access to part of the CIDR block, a specific CIDR block (if the VPC has multiple CIDR blocks) or a specific instance within the peer VPC. In these examples, a central VPC is peered to two or more VPCs that have overlapping CIDR blocks. For examples of scenarios in which you might need a specific VPC peering connection configuration, see VPC Peering Scenarios. For more information about creating and working with VPC peering connections, see Working with VPC Peering Connections. For more information about updating your route tables, see Updating Your Route Tables for a VPC Peering Connection. You have a central VPC (VPC A), and you have a VPC peering connection between VPC A and VPC B (pcx-aaaabbbb), and between VPC A and VPC C (pcx-aaaacccc). VPC A has two subnets: one for each VPC peering connection. You may want to use this kind of configuration when you have a central VPC with separate sets of resources in different subnets. Other VPCs may require access to some of the resources, but not all of them. The route table for subnet X points to VPC peering connection pcx-aaaabbbb to access the entire CIDR block of VPC B. VPC B's route table points to pcx-aaaabbbb to access the CIDR block of only subnet X in VPC A. Similarly, the route table for subnet Y points to VPC peering connection pcx-aaaacccc to access the entire CIDR block of VPC C. VPC C's route table points to pcx-aaaacccc to access the CIDR block of only subnet Y in VPC A. Similarly, the central VPC (VPC A) can have multiple CIDR blocks, and VPC B and VPC C can have a VPC peering connection to a subnet in each CIDR block. You have the same VPC peering configuration as above. VPC A and VPC B are enabled for IPv6—both VPCs have associated IPv6 CIDR blocks, and subnet X in VPC A has an associated IPv6 CIDR block. You can enable VPC B to communicate with subnet X in VPC A over IPv6 using the VPC peering connection. To do this, add a route to the route table for VPC A with a destination of the IPv6 CIDR block for VPC B, and a route to the route table for VPC B with a destination of the IPv6 CIDR of subnet X in VPC A. 2001:db8:abcd:aa00::/56 Local Local route that's automatically added for IPv6 communication within the VPC. 2001:db8:1234:bb00::/56 pcx-aaaabbbb Route to the IPv6 CIDR block of VPC B. 2001:db8:1234:bb00::/56 Local Local route that's automatically added for IPv6 communication within the VPC. 2001:db8:abcd:aa00::/64 pcx-aaaabbbb Route to the IPv6 CIDR block of VPC A. You have a central VPC (VPC A), and you have a VPC peering connection between VPC A and VPC B (pcx-aaaabbbb), and between VPC A and VPC C (pcx-aaaacccc). VPC A has two CIDR blocks; one for each VPC peering connection. 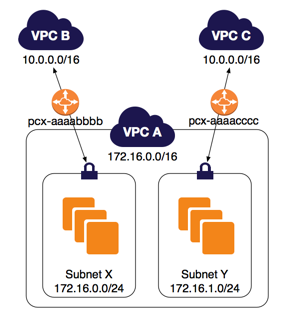 You have a central VPC (VPC A) with one subnet, and you have a VPC peering connection between VPC A and VPC B (pcx-aaaabbbb), and between VPC A and VPC C (pcx-aaaacccc). VPC B and VPC C each have two subnets, and only one in each is used for the peering connection with VPC A. You may want to use this kind of configuration when you have a central VPC that has a single set of resources, such as Active Directory services, that other VPCs need to access. The central VPC does not require full access to the VPCs that it's peered with. The route table for VPC A points to both VPC peering connections to access only specific subnets in VPC B and VPC C. The route tables for the subnets in VPC B and VPC C point to their VPC peering connections to access the VPC A subnet. If you have a VPC peered with multiple VPCs that have overlapping or matching CIDR blocks, ensure that your route tables are configured to avoid sending response traffic from your VPC to the incorrect VPC. AWS currently does not support unicast reverse path forwarding in VPC peering connections that checks the source IP of packets and routes reply packets back to the source. For example, VPC A is peered with VPC B and VPC C. VPC B and VPC C have matching CIDR blocks, and their subnets have matching CIDR blocks. The route table for subnet B in VPC B points to the VPC peering connection pcx-aaaabbbb to access the VPC A subnet. The VPC A route table is configured to send 10.0.0.0/16 traffic to peering connection pcx-aaaaccccc. An instance in subnet B in VPC B with a private IP address of 10.0.1.66/32 sends traffic to the Active Directory server in VPC A using VPC peering connection pcx-aaaabbbb. VPC A sends the response traffic to 10.0.1.66/32. However, the VPC A route table is configured to send all traffic within the 10.0.0.0/16 range of IP addresses to VPC peering connection pcx-aaaacccc. If subnet B in VPC C has an instance with an IP address of 10.0.1.66/32, it receives the response traffic from VPC A. The instance in subnet B in VPC B does not receive a response to its request to VPC A.
Alternatively, in the following example, VPC A's route table has a route for each subnet for each VPC peering connection. 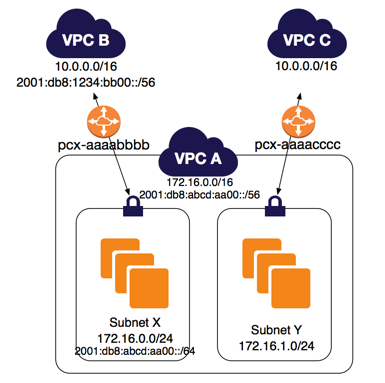 VPC A can communicate with subnet B in VPC B and with subnet A in VPC C. This scenario is useful if you need to add another VPC peering connection with another subnet that falls within the 10.0.0.0/16 IP address range —you can simply add another route for that specific subnet. 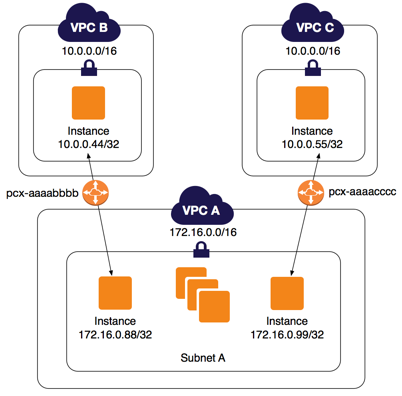 You have a central VPC (VPC A) with one subnet, and you have a VPC peering connection between VPC A and VPC B (pcx-aaaabbbb), and between VPC A and VPC C (pcx-aaaacccc). 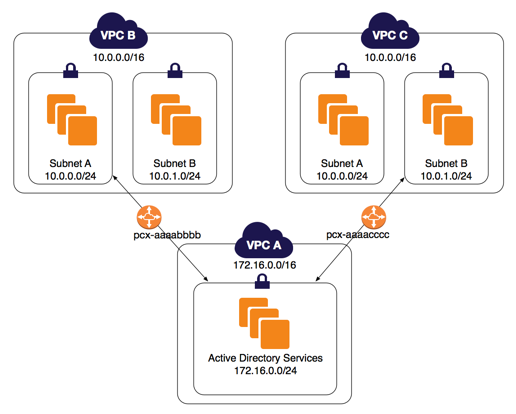 VPC A has one subnet that has multiple instances; one for each of the VPCs that it's peered with. You may want to use this kind of configuration to limit peering traffic to specific instances. 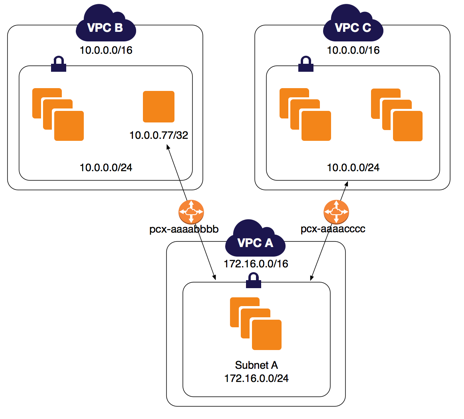 Each VPC route table points to the relevant VPC peering connection to access a single IP address (and therefore a specific instance) in the peer VPC. 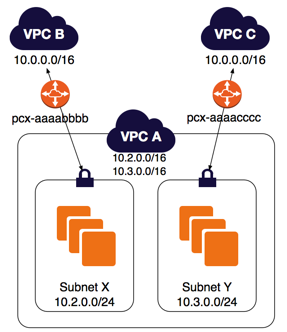 You have a central VPC (VPC A) with one subnet, and you have a VPC peering connection between VPC A and VPC B (pcx-aaaabbbb), and between VPC A and VPC C (pcx-aaaacccc). VPC B and VPC C have matching CIDR blocks. 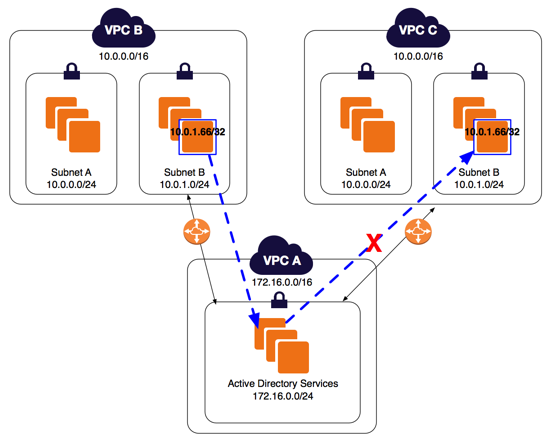 You want to use VPC peering connection pcx-aaaabbbb to route traffic between VPC A and specific instance in VPC B. All other traffic destined for the 10.0.0.0/16 IP address range is routed through pcx-aaaacccc between VPC A and VPC C.
VPC route tables use longest prefix match to select the most specific route across the intended VPC peering connection. All other traffic is routed through the next matching route, in this case, across the VPC peering connection pcx-aaaacccc. If an instance other than 10.0.0.77/32 in VPC B sends traffic to VPC A, the response traffic may be routed to VPC C instead of VPC B. For more information, see Routing for Response Traffic. In this example, a central VPC (VPC A) is peered with multiple VPCs in a spoke configuration. For more information about this type of configuration, see One VPC Peered with Multiple VPCs. You also have three VPCs (VPCs M, N, and P) peered together in a full mesh configuration. For more information about this type of configuration, see Three VPCs Peered Together. VPC C also has a VPC peering connection with VPC M (pcx-ccccmmmm). VPC A and VPC M have overlapping CIDR blocks. This means that peering traffic between VPC A and VPC C is limited to a specific subnet (subnet A) in VPC C. This is to ensure that if VPC C receives a request from VPC A or VPC M, it sends the response traffic to the correct VPC. AWS currently does not support unicast reverse path forwarding in VPC peering connections that checks the source IP of packets and routes reply packets back to the source. For more information, see Routing for Response Traffic. Similarly, VPC C and VPC P have overlapping CIDR blocks. Peering traffic between VPC M and VPC C is limited to subnet B in VPC C, and peering traffic between VPC M and VPC P is limited to subnet A in VPC P. This is to ensure that if VPC M receives peering traffic from VPC C or VPC P, it sends the response traffic back to the correct VPC. The route tables for VPCs B, D, E, F, and G point to the relevant peering connections to access the full CIDR block for VPC A, and the VPC A route table points to the relevant peering connections for VPCs B, D, E, F, and G to access their full CIDR blocks. For peering connection pcx-aaaacccc, the VPC A route table routes traffic only to subnet A in VPC C (192.168.0.0/24) and the subnet A route table in VPC C points to the full CIDR block of VPC A. The VPC N route table points to the relevant peering connections to access the full CIDR blocks of VPC M and VPC P, and the VPC P route table points to the relevant peering connection to access the full CIDR block of VPC N. The subnet A route table in VPC P points to the relevant peering connection to access the full CIDR block of VPC M. The VPC M route table points to the relevant peering connection to access subnet B in VPC C, and subnet A in VPC P.